The Family Business Association presents an opportunity for business owners and managers to get the health care insurance, legal, tax, and major cost saving implications for small and mid-sized businesses now and in the near future. The FBA continues its mission to educate family businesses and put them in the best possible position to succeed. 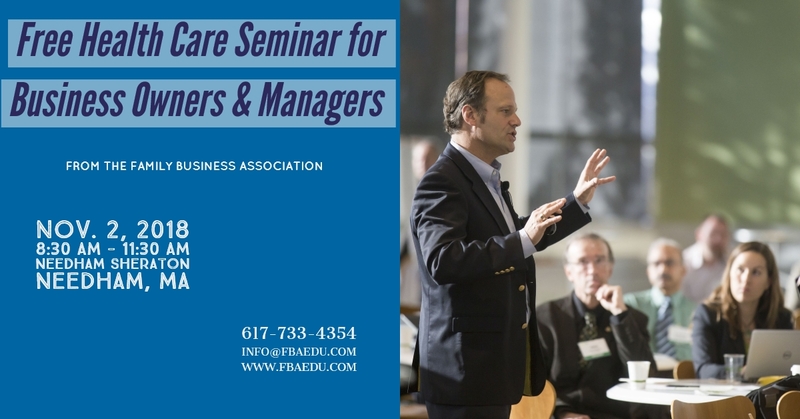 We continue that effort this fall with an outstanding free program on healthcare and health insurance for mid-sized and small business in New England. Change is constant and fast moving in this field, and you need to stay on top of what’s next. Health insurance is a critical benefit and cost within your business, and getting it right is crucial. Spending a morning learning from top experts in insurance, healthcare, tax code and benefits is not only a smart decision but a vital one for the future of your business and its employees. Your current insurer will give you information. But this seminar provides multiple points of view from independent third parties. Privately owned and family run businesses can register on the FBA website HERE. The event takes place on November 2, 2018 from 8:30 AM to 11:30 AM at the Needham Sheraton. This quick but comprehensive seminar is brought to you by Blue Cross Blue Shield of Massachusetts, inc., the largest health insurer in Massachusetts.